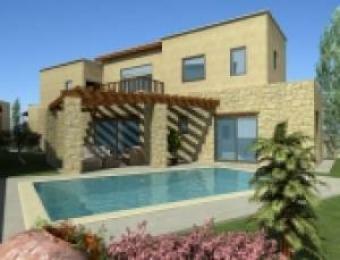 This new project is situated in Koili village, which is only 15 minutes from Paphos centre and 10 minutes to Tsada Golf. Is situated in a location, which offers superb views of the coastline and scenic inland views. Koili has a population of 450 with about 25 non-Cypriot families living there. It is situated 9kms from Paphos and 33kms from Polis. With its hilltop vantage point, there are spectacular views of Paphos and the surrounding hills. There is only one restaurant in the village itself, one supermarket and two coffee shops. The nearest police station and hospital are in Paphos. The development consists of 13 villas of 3 & 4 bedrooms with private swimming pool and 4 townhouses of 2 & 3 bedrooms with a communal swimming pool.